little Indiana: Where to Stay, Play, and Eat in Small Indiana Towns (population 15,000 and less). Just like littleIndiana.com, the magazine takes things to a whole new level! 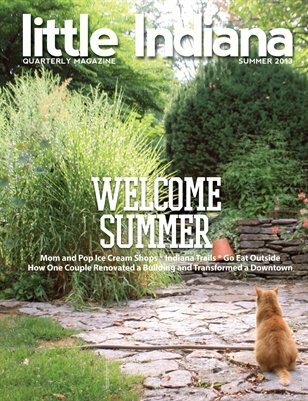 Find information about Indiana's restaurants with outdoor seating, mom and pop ice cream shops, a young couple that renovated a building and restored a downtown, memories of summer from a town that no longer exists, a business on the brink of closure, and plenty more! Don't miss regular features like "From the Hoosier bookshelf" and the Indiana trivia crossword puzzle. little Indiana. Small towns: Destinations, not drive-thrus!